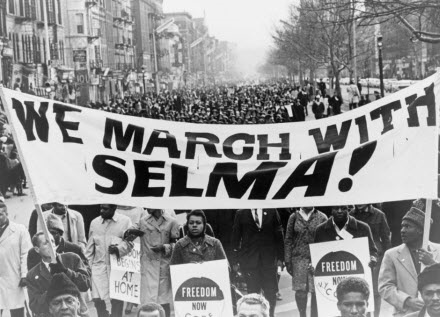 Fifty years ago, on March 7, 1965, civil rights demonstrators, as part of a major voting rights campaign in Selma, Alabama, attempted to march from Selma to Montgomery, Alabama, in protest of discriminatory voting practices. Just a short distance into the 50-plus-mile march to Montgomery, the marchers were attacked by Selma police and Alabama State Troopers near the Edmund Pettus Bridge. Among those beaten by the police were Student Nonviolent Coordinating Committee chairman John Lewis and Dallas County Voters League leader Amelia Boynton (for background information on the march, see the National Park Service website on Selma, the Encyclopedia of Alabama’s entry on Amelia Boynton Robinson, and the Eyes on the Prize page on Selma). 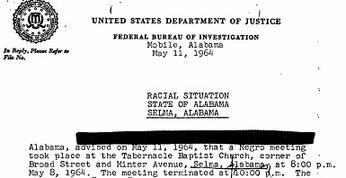 For researchers interested in studying the Selma campaign, one excellent collection of primary source materials are the FBI Files on Selma included in ProQuest History Vault (for more information on the Selma FBI files, see these earlier posts — Black History Month: "Selma" in Hollywood, in Books, and in Primary Source Documents and Who is Watching You?). In this post, we briefly consider the NAACP’s participation in the events at Selma and the NAACP’s long campaign for voting rights. During its 1965 convention in Denver, Colorado, NAACP Chairman Stephen Gill Spottswood highlighted the participation of NAACP members in the March 21-25 Selma-to-Montgomery March. Spottswood noted that some 1,500 NAACP members participated in the march, including long-time NAACP Southeast Regional Director Ruby Hurley, and Mississippi NAACP State Director Charles Evers, the brother of Medgar Evers. NAACP Executive Director was one of the featured speakers when the marchers reached Montgomery, Alabama, on March 25. The NAACP’s participation in the events in Alabama in 1965 followed in August 1965 by President Johnson’s signing of the landmark Voting Rights Act of 1965 marked the culmination of a 50-year campaign for voting rights. While newer organizations such as the Congress of Racial Equality, the Student Nonviolent Coordinating Committee, and the Southern Christian Leadership Conference, among others, undoubtedly played a key role in the voting rights effort in the 1960s, the NAACP truly can be seen as the “long distance runner” in the campaign. [This phrase is borrowed from Nancy J. Weiss’s excellent essay on the civil rights movement, entitled “Long Distance Runners of the Civil Rights Movement: The Contribution of Jews to the NAACP and the National Urban League in the Early Twentieth Century” in Jack Salzman and Cornel West, eds. Struggles in the Promised Land: Toward a History of Black-Jewish Relations in the United States (New York, 1997)]. The records of the NAACP’s campaign for voting rights can be found in ProQuest History Vault NAACP Papers —chosen as a Library Journal 2014 Best Reference Pick. In the early years of its campaign, the NAACP especially focused on combating “white primaries.” The NAACP efforts against the “white primary” began in Texas, Arkansas, and Virginia in the 1920s, with Texas emerging as a principle focus for the NAACP. Two Texas white primary cases reached the U.S. Supreme Court in the 1920s and 1930s, (Nixon v. Herndon in 1927 and Nixon v. Condon in 1932) and in 1944, the NAACP achieved a major victory in the 1944 case of Smith v. Allwright in which the Supreme Court declared “white primaries” unconstitutional. The victory against the “white primary” led to other disfranchisement tactics, including literacy tests, poll taxes, and violence and intimidation of potential voters. Beginning in the late 1940s, the NAACP began work for a comprehensive civil rights bill that would address these disfranchisement tactics. The civil rights movement scored a major victory with the passage of the Civil Rights Act of 1957. Although the 1957 law fell far short of the demands of the civil rights movement, it provided encouragement to civil rights forces and thereby helped to set the stage for the protests of the 1960s that culminated with the signing of the Voting Rights Act of 1965. The records of the NAACP’s campaign for voting rights can be found in ProQuest History Vault NAACP Papers —chosen as a Library Journal 2014 Best Reference Pick. Librarians: See the Black History Timeline, sign up for free trials of ProQuest History Vault modules, Black Historical Newspapers, ebooks, other Black Studies resources, and women’s rights during Women’s History Month. Plus, see the press release and the NAACP Papers brochure.